Mastering the baby milestone of tummy time provides baby with a comfortable way to spend time interacting with her friends. The skill of lifting the head during tummy time develops strength in the neck muscles which soon allow baby to keep her head upright for a very long time. She learns to enjoy baby play time on her tummy after developing this strength in her neck and back. She has use of her arms and hands to manipulate toys and can turn her head to see what is happening around her. She can watch her friends and her mother from this position. She is on eye level with a friend if she is also on her tummy, as the girls are in the above photo. 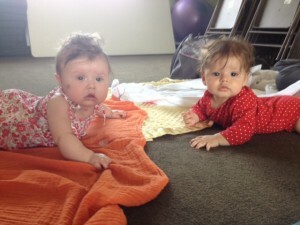 Tummy time is no longer a tedious exercise, it is an enjoyable activity for engaging with the world around baby. The strength and stability attained through strengthening muscles gives baby the freedom to move around. 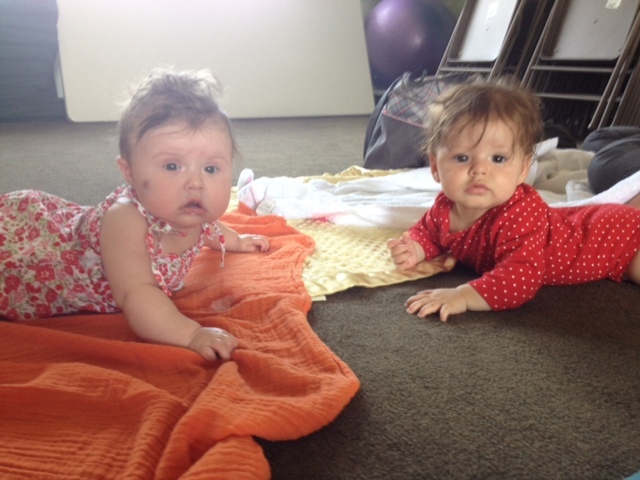 When baby hates tummy time, try placing them near another baby so they see a friend when they lift their head. Soon you will see a social smile. Observe the babies in the photo above ages 5 1/2 and 7 months. If these babies were placed in a sitting position, which they are not ready for quite yet, they would be limited in their ability to look around. Often, when babies are put into the sitting position too soon they curl backward a bit into a slouch. This pulls them off of their pelvis enough so they do not feet stable enough to fully use their arms. The slouched position also makes it difficult to fully rotate the head and look upward. In fact, trying to look around may cause them to tip over because of the weight of the head moving on an unstable pelvis. The lack of stability in sitting makes it especially difficult to engage both the focus and the hands at the same time. If the babies did not get themselves into the sitting position they would not be able to get themselves out of it either. The baby girls in the above photo have learned to roll so they are free to move in and out of this position of communication with each when they want. The seven month old baby in the photo above will soon learn how to bring herself to a sitting position since she has developed the muscle strength for stability and excellent posture. She has mastered the motor milestones of rolling, tummy time, and lifting the head. Although there are several ways baby can learn to sit, many patterns of sitting occur through a fluid movement that combines rolling and pushing with the hands. When baby learns to bring herself to sitting she has strengthened and coordinated all of the parts that need to stabilize her body so she can use her hands to play with toys and move her head to socialize with mom and friends. A baby sitting up is more free to engage with toys and people because this posture frees the arms and hands and allows even more movement of the head. Mastering tummy-time is a significant developmental milestone for baby. Several skills are acquired during this playtime with her belly on the floor. Lifting the head strengthens neck and back muscles for posture, pressing down with her hands develops a strong upper body for crawling, and stretching the trunk and hip muscles prepare her alignment for standing upright. To guide her from the position of tummy-time to the motor skill of rolling, gently lift one side of her pelvis a little while you bend up the knee of the same side. Turn her slowly onto her back while you guide her with your hands on her leg and hip. Your hands show her where she needs to move her body parts to turn herself. Soon, she will do this on her own. After studying Stellar Caterpillar Tummy-Time Tips, guide baby into some daily play time on her belly. With a few interesting toys within her reach and your supportive instruction, she will gain both comfort and strength while on her belly. She will learn to enjoy this position. Soon, she should learn how to transition herself into and out of tummy-time. Babies are most confident and independent when they can get places on their own. This means they have the skill of getting in and out of tummy-time, sitting, crawling, standing, and any position of rest or play. They learn to go from a stationery position to a movement of locomotion. 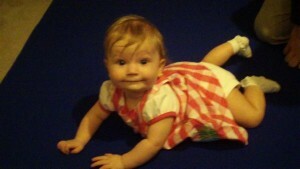 For example, in the above photos Donna guides five-month-old Zizu from tummy time into a roll. Soon, Zizu will learn to play on her tummy and them roll across the floor to a new location. Learn to put baby down on the floor (on her back) and and observe how she transitions into the movement she would like to do. Even if she has learned to stand and side-cruise, occasionally put her down on the floor and see how she moves herself from her back into the standing position. If she loves to be on her tummy, how does she roll there? If she is enjoying sitting, put her on the floor on her back and see how she rolls and comes to sit. Independence means the ability to move in and out of these positions. When a toddler has gone through all of her milestones in a skillful way, you can put her down on the floor on her back and observe how she gets up. She will roll to sit to crawl to stand to walk all in a few quick seconds. It is the developmental sequence right before your eyes!